You can create a system image of Windows-10, which contains a copy of Windows 10 and copies of your programs, system settings and files! The Windows 10 system image is then stored in a separate location from the original programs, settings, and files. You can use this image to restore the contents of your Windows-10 computer if your hard disk or entire computer ever stops working. 1.) ... Set up a system image under Windows 10! 2.) ... Windows 10 system image options! ► System Settings on Windows 10! 1.) Set up a system image under Windows 10! in the Windows 10 run Dialog [WindowsR]. (Image-1) Create a system image on Windows 10! Backups are created in sets known as backup periods. 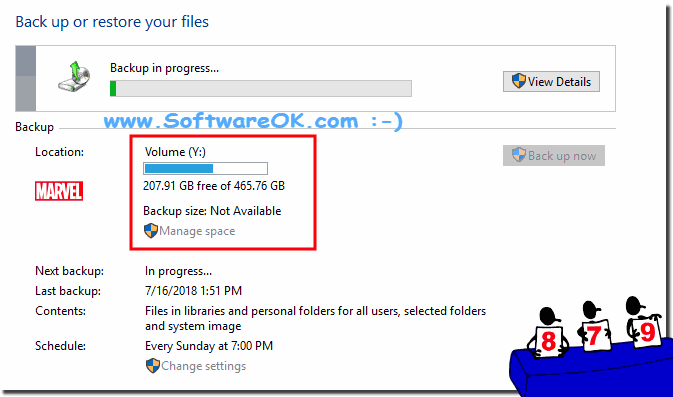 To help maximize your disk space, Windows 10 Backup backs up all selected folders the first time it's run and then it only backs up files that are new or have been modified since the last backup was made. Periodically, Windows 10 creates a new, full backup. Each full backup is known as a backup period. When you view your file backups, you see all of the backup periods labeled with date ranges. If you decide to delete file backups, you should always keep the most recent file backup. By default, Windows 10 automatically saves as many system images as it has space for without taking up more than 30 percent of space on the backup disk. Once the disk starts running out of room, Windows 10 deletes older system images. You can set Windows 10 to retain as many system images as it has space for on the backup disk or to only keep the most recent system image. You should always keep the most recent system image. If you are saving your system image on a network location, you can only keep the most recent system image of Windows 10. A windows 10 restore point is a representation of a stored state of your computer's system files. You can use a restore point to restore your computer's system files to an earlier point in time. Restore points are automatically created by System Restore weekly and when System Restore on windows 10 detects the beginning of a change to your computer, such as when you install a program or a driver. System image backups stored on hard disks can also be used for System Restore, just like the restore points created by system protection for windows 10. Even though system image backups contain both your system files and personal data, your data files won't be affected by System Restore. You can create a restore point on windows 10 manually at any time by following the steps below. 2.) Windows 10 system image options! Now you can select a drive of course external data storage media can be damaged due to data loss on the PC or notebook. And start the Backup. One can decide in the following steps in person what everything should be secured. Sometimes, not only can the System Archive be useful for deploying Windows 10 if it does not work to repair it, but also for extracting accidentally deleted important files that have been stored in the archive! See also: ► Bit-Locker Drive Encryption in Windows-10! 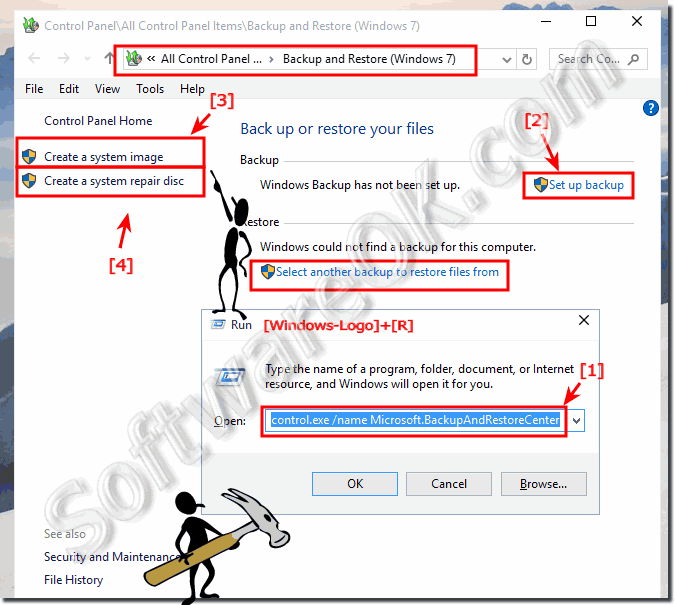 (Image-2) System image Backup on Windows 10! How do I make a system image at win 10? Windows 10 automatically create a system image? Programs to make system dump of tablet or on MS surface PRO? Create system image win 10? Windows 10 system image shortcut? System image under Windoes 10? Windows 10 where is the file system image saved? STAMP IMAGE UNDER Windows 10? Where does win10 save system image? How to make an image of windows 10 installed? Windows 10 system image create? Create a system image Windows 10? Win 10 create system image? How can I create an image of my programs? System image in Windows 10? Freeware windows 10 system imageing? Manually create Windows 10 backup? How to make a picture of the hard disk? Create a system image of Windows 10?